Awesome, but needs more of Samus' crashed gunship in the background. So with those rumors of Stage Builder coming back floating around I have to ask. Being able to assign more than one music track to a custom made Smash stage and having various background and pieces and whatnot based on games from Nintendo (and possibly represented 3rd party) franchises. Definitely yay. Also I hope the textures and whatnot aren't locked to a certain background like in Smash 4. It'd be fun to mix and match them. WE IN, BOYS! WE DID IT! THEY LEAKED IT! This calls for a celebratory stage idea! So I looked back through my posts, and I realized that I don't think I ever posted this particular stage... which is shocking to me, because it definitely seems like a stage I would have posted before now. If it does look familiar, feel free to call me out for being a moron, but in the meantime, I think it's the perfect stage to celebrate the official (well, maybe not official, but... certainly undeniable) confirmation of Stage Builder! Ladies and Gentlemen, welcome to Bob-omb Battlefield! Ah, how I've missed you, my crappy MSPaint drawings. This stage takes place on a cross-section view of Mario 64's famous first level, with the playable area spanning pretty much the entirety of the battlefield! The stage is a walk-off, limiting itself to the upper parts of the map, with exception to the area below the bridge - which forms a pit - and the island in the sky - which forms a nice aerial platform. Aesthetically, you'll see goombas and bob-ombs walking about the map, just minding their own business. First of all, that bridge across the gap? It's not just a semi-solid platform. No no, just like in the original game, standing on that bridge will cause it to tilt! be careful of where you stand, or you might slip down below! But of course, there's a far more obvious threat on this stage than a simple flipping bridge... and that's the Chain Chomp! Yes, as the match goes on, ol' chompy will idly hop about in his little area. But every so often, he'll start to hop about more vigorously than normal. If he does, you better run far away, because a moment later, POW! He'll lunge out of the background, smashing into anyone in front of him and dealing a whopping 25% damage and heavy knockback! Yikes! Aside from that, though, there are no other hazards. So just... y'know, beware of Chomp. I for one cannot wait to recreate this (and more!) in the coming weeks. background element and can’t be swam in. New Home can be seen in the distance. The stage is NOT pixel art, everything is updated to high quality 3D models. The stage’s central gimmick are the Bridge Seeds. Bridge Seeds occasionally spawn like items do, out of the sky at random. They spawn about as often as items when set to “rare”. The way they spawn doesn’t consider them an item, meaning they spawn at the same regardless if no items or every item is activated. They can be picked up like items (they make the little squeak sound from Undetale upon being picked up). Unlike in Undertale, they are held in the hand instead of on the head. They act like standard items (such as the Pokeball and Smoke Ball), being able to be thrown around and replacing most imputs. Bridge Seeds can’t hurt enemies, and if they touch the ground nothing happens. Pretty useless, right? No quite. If thrown down one of the sides of the stage, it blossoms and expands backwards, making a new platform! 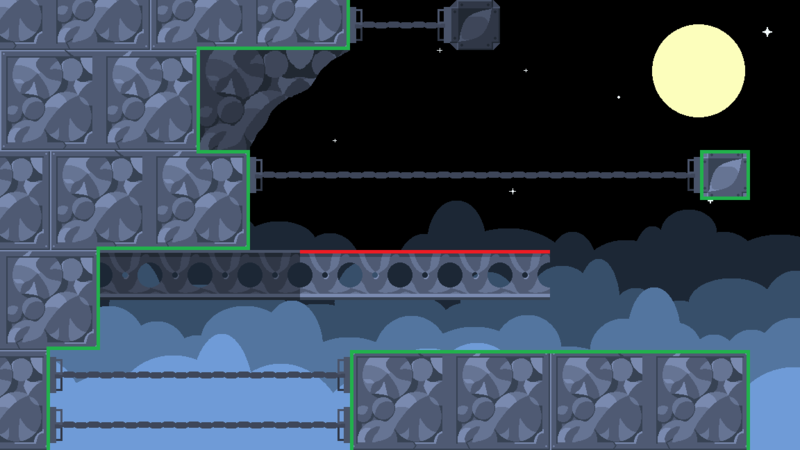 Bridge Seed Platforms are roughly one Training Mode Block tall and wide. They don’t have ledges, so they are mostly helpful for opponents launched upwards, not downwards. The small size makes it a poor camping place, as they can’t roll away or anything. After 45 seconds, the Bridge Seed Platform gets lost in the current and falls down. The Bridge seeds don’t spawn on the hazardless version of the stage. Rarely, upon selecting the stage, various parts of waterfall’s scenery spawn in the stage’s background (Echo Flowers, Sans’s sentry stand, and a vacant Dummy, among others). Pressing ZL and ZR puts this stage in “battle mode”. Everything but the fighters are in black and white. The textures of the parts of the stage are altered to make this look not terrible. ...the wind starts to blow and leaves float across the screen. The Bubble Monkey blows a bubble and floats up into the air and over the waters. Then, Tessie rises from the lake! Tessie's head and back function as platforms...that is, until she decides to leave. Tessie will swim off the screen, KO'ing anyone stupid enough to still be standing on her when she goes off-screen. A few seconds later, the Bubble Monkey floats back into the stage, and the cycle can repeat. Battlefield and Final Destination versions of the stage float way up in the sky, where the ground below is seen at the same angle as EarthBound's gameplay. You are high up enough that you can even see Jeff's school in the distance! Obviously, this stage would warrant the addition of a new Winters theme remix as well. And not the version that's just "Snowman." Stage Builder as a true 'sandbox' would be dope. Actually, you could even use the background elements from other stages... after all, in the Omega and Battlefield forms of any stage, the backdrop has no real effect besides looking cool. Also, ULTRA YAY for stage Builder. Dudes, the Persona stage looks incredible. And Stage Builder is looking insanely amazing. I thought this was some sort of leak and was wondering how this was allowed to be shown in these forums. Then I checked online and oh my god the announcement came out of nowhere. I mean I'm not talented to make anything good with it, but I can't wait to keep an eye on this thread and see what you guys make! Yo, Stage Builder looks lit! I can't believe they added background and foreground elements; it's life-changing. Plus I can recreate all my Wii U stages and the ones I made for the Stage Competition. I cannot wait! Ladies and gentlemen, I give you Outer Wall, from Cave Story! I've made an Outer Wall stage before, but tbh it kinda sucked. This is the redemption I spent waaaay too long making. Platform-outlined version here. The first goal I aim to to accomplish with Stage Builder is to make a home stage for characters that lack one. Like how Bowser and Dr. Mario lack a stage that really fits them well enough in this regard or how there are too few Fire Emblem Stages for each FE character to have a home stage of their very own. After that I've been thinking about trying things like re-creating as many of the winning stages from the Ultimate Stage Contest as possible. TKOWL's Golden Pyramid for example will be one of the first ones I make in this regard. I considered doing that, but I think I'm gonna hold off on trying to recreate other people's submissions. If only because stage sharing exists, and I'd prefer to download those stages direct from their original creators (hint hint wink wink nudge nudge) than attempt to recreate them myself. That.....is true. Now that you point that out I think I’ll do the same. Oh, I didn't even think about the fact that I can recreate the stages I made for the contest! This feature got even more exciting now! Definitely going to try to recreate some of my stages from the contest as well! It's pretty exciting, I never really thought I'd have the chance to play on them. Thank you Sakurai! I want to try and give Pac-Man a decent stage again. well RIP Outer Wall then, guess Smash just couldn't resist crushing my dreams a bit. Edit 2: Decided to recreate Castle Bleck instead. Level ID is 1C9BC1HL. Give it a look! I want to draw as much attention to this as I can: Platforms for custom stages are broken. The small vertical sides act as solid terrain. You can tech on them, and they break projectiles. To easily test this, just get Villager and use his Lloyd on the side of a platform. It will explode on the edge of the platform instead of going through it like a platform on Battlefield or Town & City would. Just be clear, YES I've made the edges ungrab-able. And YES I drew a single line, not a rectangle. I've tried everything and no matter what I do there seems to be NO way to create a platform without this problem. I love stage builder to death, I've spent hours creating alternatives to legal stages for my friends and I to play on. This oversight (assuming it is one) completely ruins the mode for me. Since you can tech on the sides, a simple Battlefield clone effectively has tiny caves of life sprinkled all over the stage, and any character with a projectile can randomly have it rendered useless. So wait, in Stage Builder you can't make passable platforms. Is that what you're saying? You can pass though the top and bottom as normal, but as you can see in the video I just edited in, the small vertical sides of platforms destroy projectiles, can be teched on, and even hinder movement. As they are right now, any stages with platforms are completely unsuited for serious play. I mean, yeah, that's an issue, one that others may care a lot about. But personally I've never really been into the super-serious side of Smash, and I don't think it's that big of an issue in casual settings, so I'm not too concerned about it. I'm sure it'll get fixed in time. So on the subject of this: I managed to recreate my one and only winning entry, Fort Dragonfall! ID is RM9DSD81 - I think it came out pretty good! Hazardless, obviously, though I made the version where the Dragon is alive for some added flair. Hope you all enjoy it! First thing I looked for and found was a pretty good one. Has moving ghosts as background elements. That's good, but I also had another idea.